Lot Detail - (M) Extraordinarily Rare Israeli Marked and Israeli Defense Force Used Mauser 66S Bolt Action Sniper Rifle. The live portion of this session begins on Thursday, April 25, 2019. (M) Extraordinarily Rare Israeli Marked and Israeli Defense Force Used Mauser 66S Bolt Action Sniper Rifle. The last time a shipment of these rifles arrived in the United States was when Springfield Armory purchased approximately 100 of these rifles from the Israeli Defense Force (IDF) and made them available in the US market during the late '90s. Springfield Armory certificate of authenticity is included. The IDF favored these heavy sniper rifles as pieces to be deployed in overwatch positions in areas like the Golan Heights and the Gaza Strip, where their weight was a non-issue. These rifles were built off the Mauser 66S action and this example has the following features: telescoping short action, single stage trigger with trigger widener with "HB" in circle allowing for gloved use and set at a crisp 1#. Three round blind magazine. 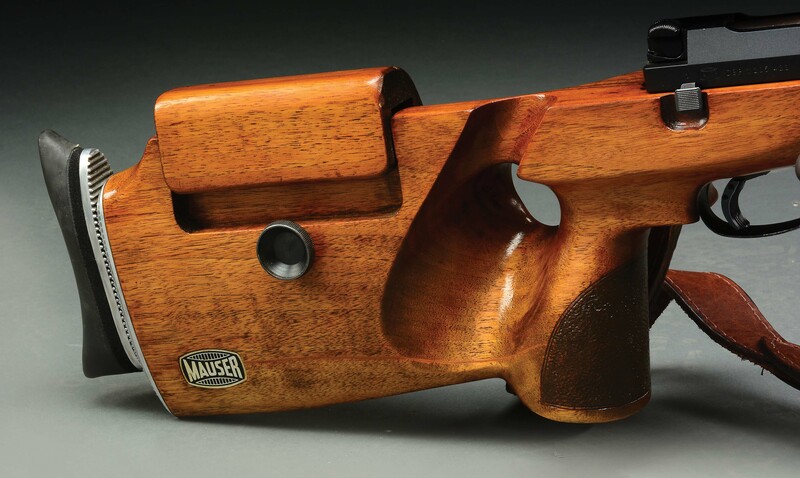 Right side of action stamped "(Mauser Logo) DBP 1205 423". 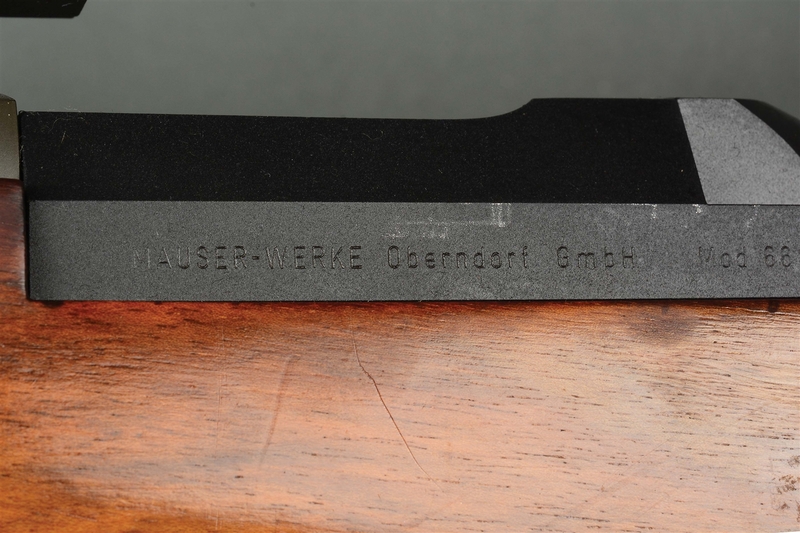 Left side stamped "MAUSER-WEKRE Oberndorf GmbH Mod 66S". 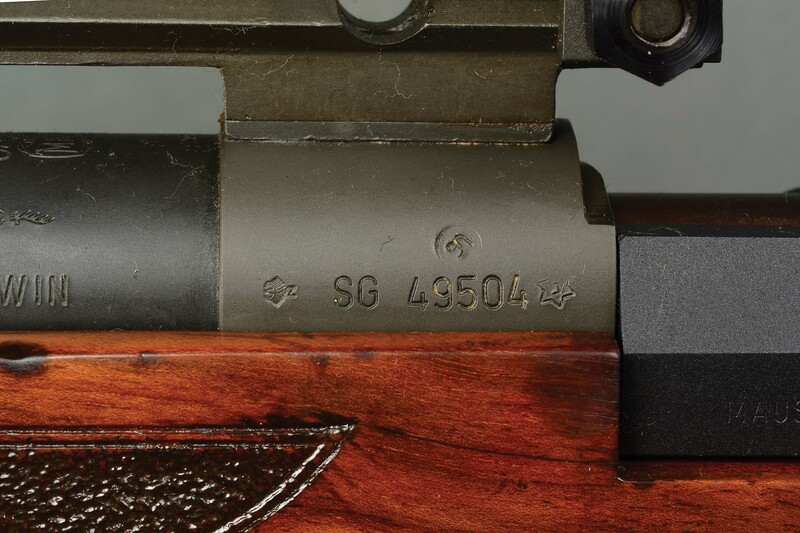 Left side of scope mount stamped ""SG 49504" with Hebrew letter in a circle and a Star of David a second character enclosed, and "Made in Germany". Right side of scope mount electropencilled "20" underneath reapplied bluing. Bottom of scope mounted stamped "31". Action also has "(Eagle) / N" nitro proof. Barrel has "(Eagle) / N" nitro proof, "IC" stamp and Ulm antler proof mark. 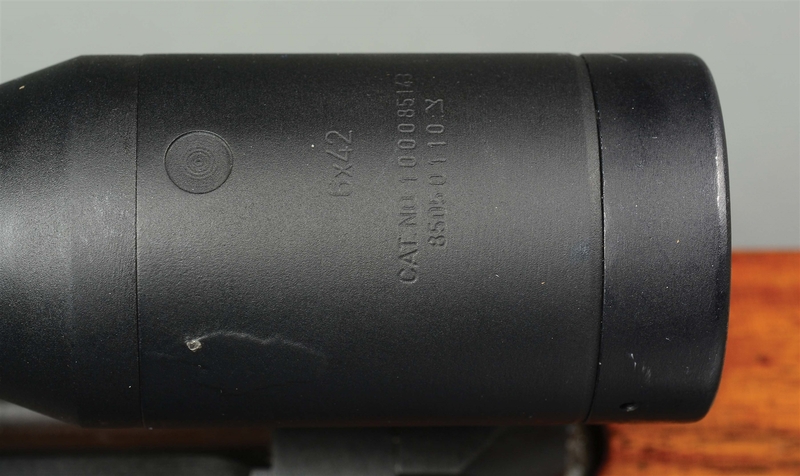 Top of barrel has "Original / (Mauser Logo)" under scope mount. Muzzle brake has ten slots plus one 45 degree transverse slot at end. Wooden benchrest style stock has a spring loaded adjustable cheeckpiece, adjustable rubber buttplate, right handed palm swell, palm and forearm checkering, Mauser logo on left toe, added Talon sling swivels on left side with "The Leatherman" leather sling, and added bipod rail with GG&G bipod. Gun and stock are numbered together, with 49504 on barrel and 49504 on stock. 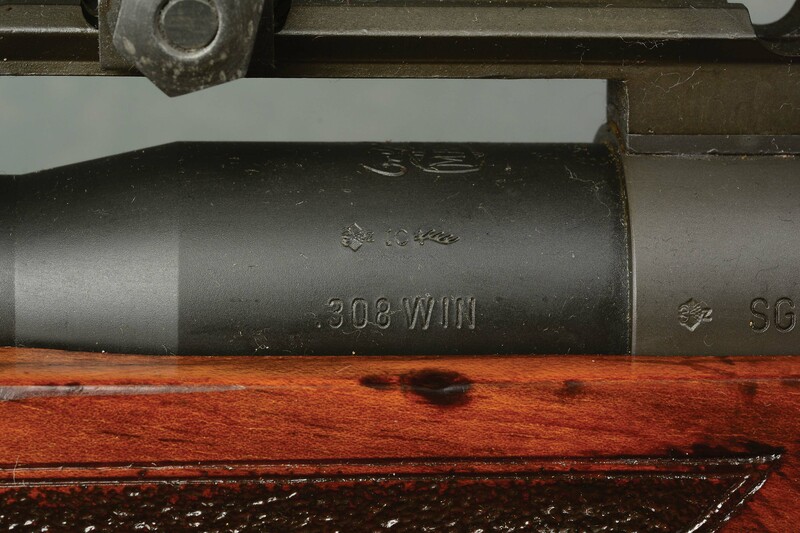 Part of the "50" section of numbering on stock was cut when bipod rail was added. Rubber adjustable buttplate marked "MORGAN ADJUSTABLE / PATENTED / YOUNGSTOWN O." The rifle is topped by a 6x42 fixed power scope with rubber cover, stamped "6x42 / CAT. NO. 100085143 / 85050110 (Hebrew Character). Small indentation in scope that may have been intended for a radioactive sticker is now vacant. Reticle is range finding and features a bullet drop compensator. Included with this lot is certificate of authenticity from Springfield Armory. CONDITION: Rifle is in very fine condition. All metal is very nice with a few handling marks, but nothing serious. Barrel and action have been refinished at some point and retain the vast majority of the reapplied finish. Stock has seen use and stippling has had paint added to it, probably as a result of dirt and other abrasion. Wood is excellent with the usual handling marks and impressions but no cracks or splits. Cheekpiece and buttplate adjustments works correctly. Optics are excellent with exceptionally clear glass. Smooth action and bright bore with sharp lands and grooves. Thumb safety is stuck in fire position. This is a once in a lifetime chance to own an unbelievably rare Israeli marked sniper rifle! 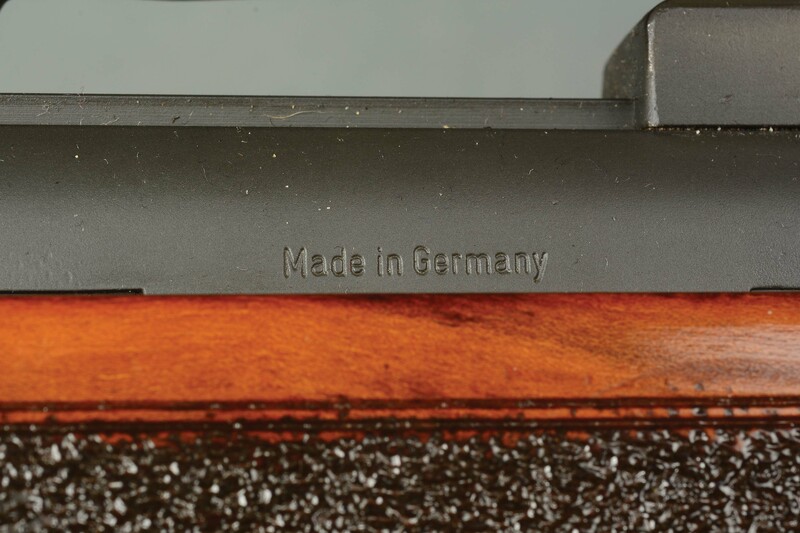 CORRECTION: Top of barrel has "Original / (Mauser Logo)" under scope mount.